Do you ever find yourself in a decorating slump, or just plain ol’ STUCK? I do. Sometimes I just can’t get my mind around what I want to do or what I need in certain rooms. Or I have too many ideas and can’t really do any of them due to finances. Usually I just let the room evolve and change it over time, using what I have, until I find exactly what I want or something clicks. Patience is just a part of the decorating process, unless you are going to design and shop for the entire room all at once. And what fun would there be in that? Well, don’t answer that. Maybe it would be fun and even easier to not have those limitations. But I kind of enjoy the challenge of going one step at a time, the thrill of the hunt for the next piece of the decorating puzzle and watching the house transform. And I think I love my home more because of how it has evolved with me and our family. I just keep moving things around, trying different arrangements and combinations. Sometimes when I try something in a new place, it leads to a decorating epiphany! Suddenly I get a new vision for my house or what furniture I want or even a new idea for how a room should be used. That is kind of what happened this week. I was taking a quick peek around the flea markets near me, just in case I saw anything that anything I might need or that might inspire me. I found a family of brass horses (actually, one might be a cow) and I just couldn’t leave them there so they came home with me. I’m always drawn to animals and these little guys will be able to go just about anywhere . As I was about to leave the flea market with my new little brass friends in hand, I spotted this fun console table. I really love unique pieces, so of course this one caught my eye. I love its beachy look and one-of-a-kind shape. It seemed versatile enough in size and affordable in price so I decided to risk bringing it home without being certain where I would use it! I like finding things that add a new layer of personality and character. And it definitely got me out of my slump! Just for fun I decided to try it in the entry first, so I moved the dresser that was on this wall (which I got from the same flea market awhile back!) to a new wall in the entry. Nothing is styled or set up yet, it’s just an experiment. The color really compliments the maps in the hall to the right. When we moved the dresser over to the wall that is in between the entry and the front room, we loved how much cozier it felt with another piece of furniture. I was a little surprised how much I liked the feel of it there! There was plenty of room for a chest, we had just never had the right piece to try it. Finding the new thrift store table not only brought something new to my house, but it gave us the opportunity to try the dresser in a different location. Right away I decided that I LOVED having a lamp in that area (I LOVE LAMPS!). A mail drop and storage right next to the front door made the most of that otherwise dead space in the entry. Furniture and lighting instantly brought more warmth and character to the space. And once I moved the dresser I found myself suddenly inspired with new ideas for the living room area adjacent to the entry. When you step out and try one new thing it can lead to another and new creative ideas start flowing. I love when that happens! Rearranging furniture and accessories can spark new ideas I never would have had by leaving everything the same or just trying to imagine something new in my mind. Even if I end up putting things back where they started or trying another arrangement I like better, it is always fun to see the possibilities. You never know what might happen! Rearranging furniture helps me to have a clearer vision of what I really want or need in a space and let’s me see my house with brand new eyes. 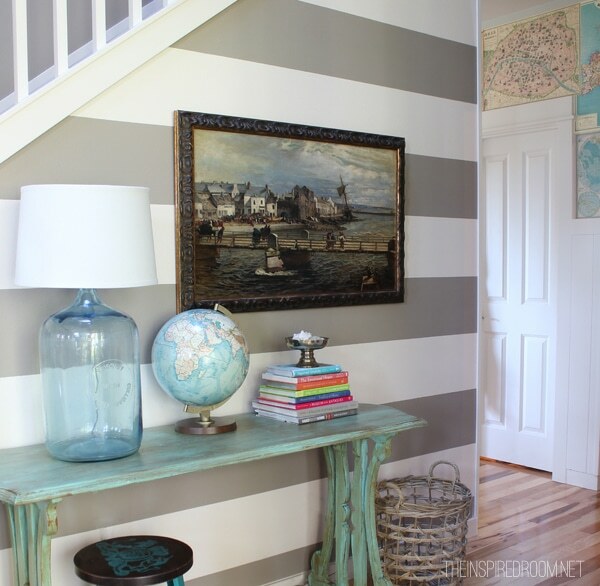 Do you rearrange furniture to inspire new creativity at your house? You’re a girl of my heart! I rearrange things in my house ALL the time. Before Thanksgiving I swapped the Dining room for the Living room, because we have more space in the former LR and we would have extended family over. What a difference it made, and with the fireplace going during dinners we love that change! I also love lamps like you, and I am always on the hunt for the right ones. They also get to travel around the house, its amazing how a lamp can set the tone for a whole feel in an arrangement. Well, my husband knows that if I am alone at home for a day (or even a few hours …), things may be “a little” different, when he returns :-) Our life evolves so our home must evolve too. If everything was permanent, it would be BORING! Melissa, I just wrote a post about how to love the home you are in and your post fits in perfectly with my post. I so agree that sometimes one small purchase can be the beginning of a whole new look. I use to get a small 4in. pot with a plant from the grocery store and clean and rearrange a whole room around that one little plant. It was the spark that would ignite new ideas. Love your motivating post, Happy Thursday to YOU! What colors did you use on your walls? Refreshing. Love the colorful stack of books and that green table. I would have nabbed it too. I’m sending this link to my ’20-something’ daughters who are just acquiring & developing their style. But there’s plenty for me here too. I need to move something around this weekend. Thanks. 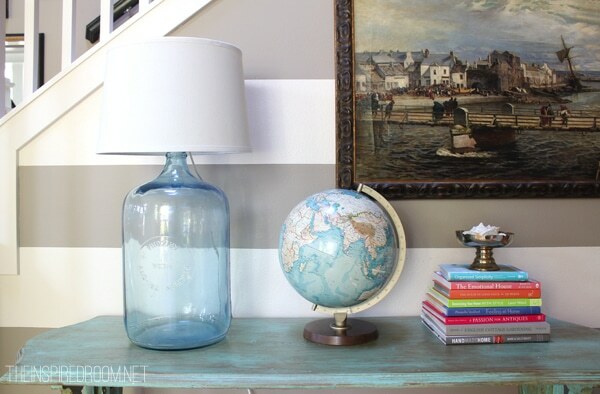 I love the simple, clean look of the earth tones with some fun colors here and there… and yes, I am also a re-arranger. I get it from my mother. What great finds! 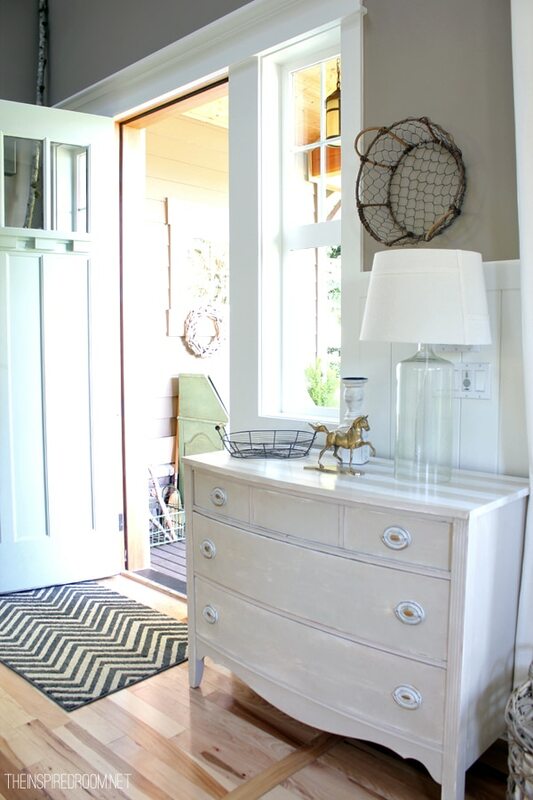 The new console table looks great in your entry, and I love the dresser next to the door. It is fun to re-arrange things now and then. I read your – blog daily and almost every time I come away with your intended response – inspired. I re-arrange furniture all the time. Mostly because I’m cleaning, but sometimes just for change in the view of one of my favorite paintings (of course I love all my artwork). Because of living in an apartment moving furniture is a sweat equity endeavor, but rewarding just the same. Enjoy your day. Thank you. Love the new table. The color and patinia is gorgeous and does go really well with the map wall! Moving the dresser to the other wall makes the room seem more invitiing and I love the brass horse! I always feel inspired when I leave your website. I love dragging things from here to there, shopping the house, pulling things from one room and introducing them to a completely different location. It makes me really appreciate what I have … and keeps me from feeling the need to gather more stuff around me. Ha! Do I ever rearrange things? My family would ask, do I ever not? Raising 7 kids on 1 income left me with motivation to beautify my home with 2 self taught skills; painting and rearranging. I never get tired of trying new arrangements, and you’re right, one thing usually leads to another! The new table color with the stack of colorful book bindings really adds happiness to the area. 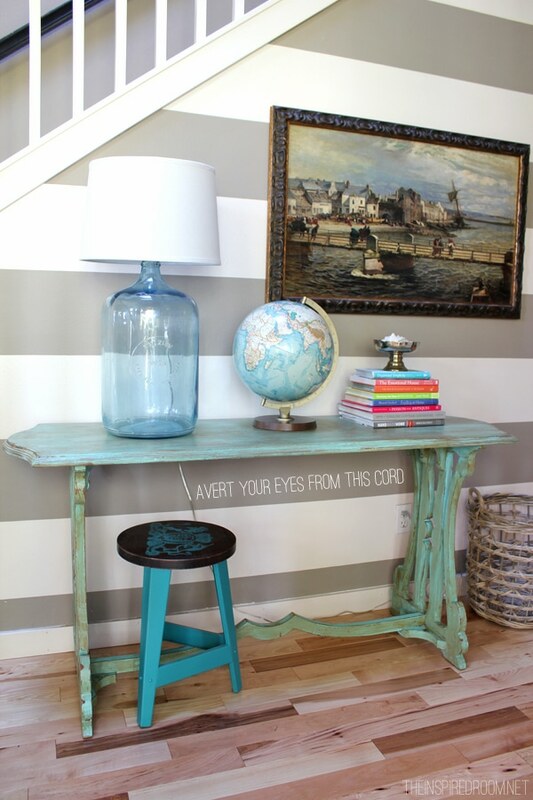 If the lamp cord bothers you, you can use painters tape to it to the back or underside of the table. I do it all the time! Great finds! I love the new furniture layout. Your house seems so cool, crisp, and cozy. Like a lovely almost-lake cottage should be. Good eye for that blue table. Love the lines and it’s a very versatile piece. Looking good my friend! It looks fantastic! I love how just rearranging a few things can give a room a whole new wonderful fee. Your house always amazes me. I think it’s my very favorite “online house.” What I love the very most… other than that gorgeous kitchen you’ve got going on… are your hardwood floors, because HOLY MOTHER OF BATMAN! Those floors of yours are CLEAN! We have a little boy toddler. And a 13-year-old boy. That’s a combination that spells out, “Our Floors Are Currently Covered In Under Armour Sneakers, Toys That Make A Lot Of Noise, Heavy-Duty Toddler Board Books, Pieces Of Cheerios, And Crushed Goldfish Crackers.” Sometimes when I need a little mood-lifter, I’ll just stop by your blog and look at your glowing floors! And then I think, “I’d sure love to have that girl over for coffee sometime,” because do you know what? When we were DONE with all the coffee-sipping, I’d have you look around my house and say things like, “The quilt on your bed needs to go, and THIS is the one online that we’re going to order to spruce up your master bedroom. And how on earth have you lived with this ridiculous rug in your living room for so dadgum long? Let’s put it on the curb with a FREE sign and buy THIS rug from THIS online source.” And then… while you were very busy rearranging my furniture and buying new decor for me online… I would haul out the vacuum cleaner and the Shark steam mop and clean my floors! I love your blog; decorating has never been my spiritual gift, so I like to peek in at what you’re doing over at your house sometimes. Someday I hope all my furniture will find their sweet spot and I won’t feel like I need to move things around as much. Then again, sometimes it’s just fun to try something new! The table is so cute! And I love rearranging things – especially this time of year. 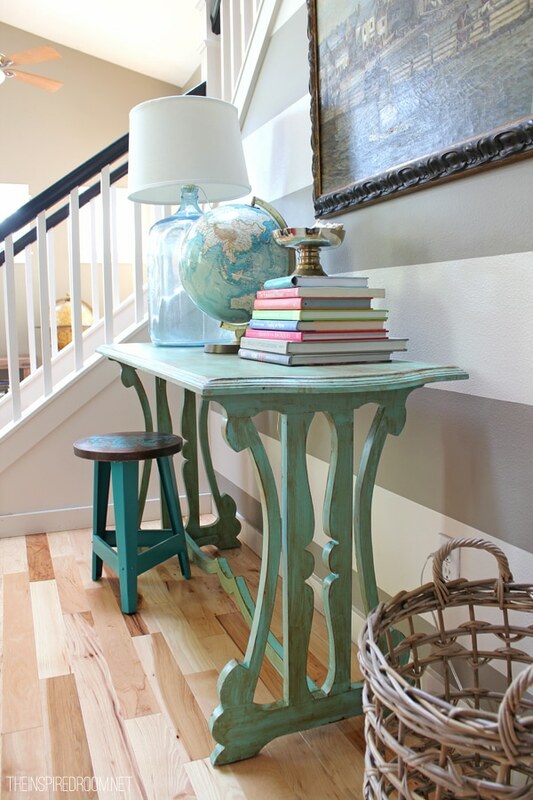 Love that sweet, little, blue table. I imagine that’s one of those pieces that someone is going to regret letting go of down the road!! I’m always doing that, trying to pare down and then regretting it later. But hey! lucky for you!! I also love your dresser and would love to know what you painted it with (will search your site and see if I can find out the answer!) I’ve been toying with the idea of painting my dinning room set and after seeing your little dresser I can actually “see” my side board, table and chairs painted in a similar shade. It’s very dark wormy maple so the change would be drastic! The sideboard has a light colored marble top and I was concerned that paint and marble might not go together well but now I don’t think that’s true. So much to do on the house remodel still but looking forward to the day I can take all of my things out of boxes and start making my rooms come to life. Thanks for being here to inspire and keep pushing me to make my house a home! Hi Rose! Lucky me, my dresser was already painted that way when I bought it! I love that our flea market paints things before they sell them, saves me a step! :-D Sounds like your dining table would be a fun makeover! Maybe check into chalk paint, it is a great paint for furniture makeovers! I re-arrange my furniture for each season. I try things in new places, like last summer I flipped my living and dinning rooms and I LOVE IT! I’m the one who has to leave notes on door telling my hubby or kids to make sure they turn on the lights because the furniture is re-arranged. I have learned to love lamps, we only have one ceiling light in our living/dinning room combo and that is in the dinning room, so I have lamps everywhere. Thank you Victoria! Yeah, we’ve had a few calamities in the dark thanks to my furniture rearranging and forgetfulness :-) … haha. It’s a risky business! Wow, LOVE it!!! Curious if you also tried swapping the lamps?? Absolutely LOVE it when “fresh” inspiration strikes…I could use some of that right about now!! I was just telling my husband and kids last night how much I always loved rearranging furniture in my room when I was a kid since it gave it a different feel which I always welcomed!! So fun!! Everything looks great!! Thanks for the inspiration! I think I will be rearranging things around here in the next few days especially since we are in the middle of snowy cabin fever here!! Beautiful! My living room is painted nearly the same color and I also have light hardwood floors. I’ve been considering painting the trim white and bringing in lighter furniture. This is exactly what I’m going for! Looks great! Yay! My old house was the opposite of this, I had dark floors and white walls but I’m really enjoying this fresher more casual look. I love it! Thank you! Yes, it is a Craftsman style. It’s a newer house so I love that it at least has some more old-house details to start it off with a little bit of character. I’ve been enjoying adding more details and character to it and hope to keep on going! It’s fun. Great find, Melissa. And you didn’t even have to paint it?! Awesome! I move stuff around constantly! From room to room and floor to floor. We have a tri-level house and I am a pro at “flipping” furniture end over end to get it from floor to floor by myself. I’ve done huge pieces that way! I once got my Dalmatian stuck on the upper floor for the day because I got the couch stuck on the staircase! It all works, our home evolves to fit our needs. 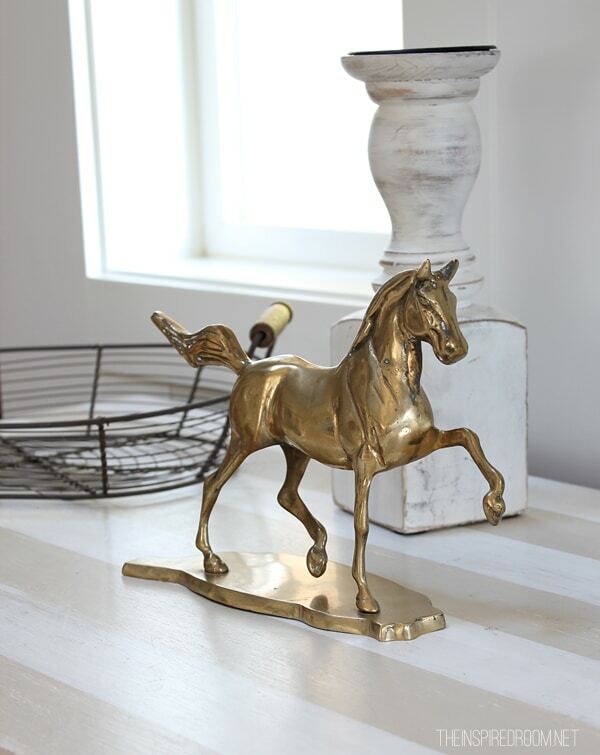 BTW, I love the table, but I love the little brass horse most! What a FIND! Just visited a relative who had the same floors like you… they are even more gorgeous in person!! Great great choice.. I did notice in hers though that there were gaps in between some of the boards so some dirt gets in. I’m wondering if yours do too?? Just wondering if it is an installation issue or just the type of flooring.. I have to know what flea market you found that wonderful table in?? Love what you’ve done. 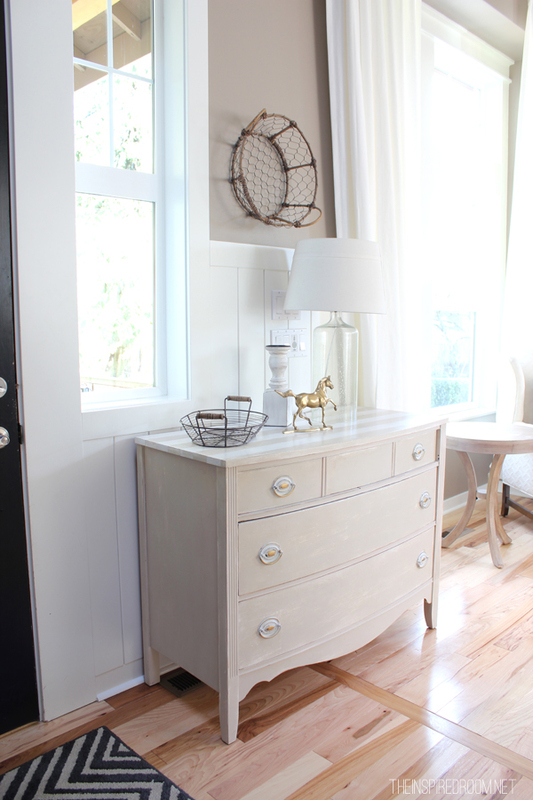 I have a dresser in our foyer, and it is so incredibly handy. We keep our keys and techno gadget chargers for travel in the top drawer. In the bottom two drawers we have scarves, gloves, hats. Very handy. I an a serial re-arranger. Change is vital to design because it keeps things fresh. Right now we are painting our gigantic media console from a very dark brown stain to a lighter greigy/greenish/off-whitish color with a few sanded off spots for a worn look. Already with just the base coat it’s so much brighter along a fairly dark wall…I love it. Should have done it years ago. I love everything I have, everything I’ve added and have other plans for some things (and so far there’s very little sitting unused in the garage and scheduled for give-away. So much of my activities this past year have been inspired by your posts and you are definitely someone I love to share that morning cup of coffee with. Rose, check out Revolutionary New Paint Line for Furniture (Paint It Monday) at The Creativity Exchange, http://www.thecreativityexchange.com for February 10, 2014. Cyndy says it really is simple enough to inspire me to overcome my haven’t-painted-in-40-years fears. I love brass animals too, I have so many of them myself! The wire basket looks so pretty on your wall! What great inspiration shots of your home! Love, love, love it all. What great finds. 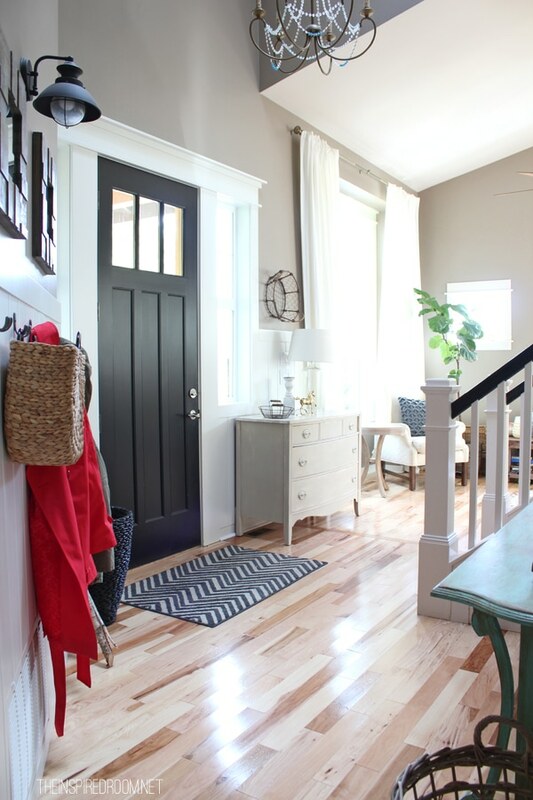 I love the black front door, but is the front door color also black or just the inside? What color is it? Where did you get the idea to paint the door black? I just love all your ideas. Looks great! I am picking up a new dresser from Craigslist this weekend for our finished basement. I am really hoping that it will inspire a deep cleaning session and new ideas for that whole area of the house! Let’s hear it for second hand quality finds! Such a coincidence that I have that very same brass horse I picked up while thrifting! I actually got it to acknowledge my eldest son’s new found love of horses. This post is so relevant for me right now as I am in the midst of re-organizing my little office, shifting furniture around paring down on what is displayed. Wow, that is a coincidence! How cool!!! Recently I shifted a bookcase in my living room to another wall just as an experiment, too. My living room has stayed the same for many years because I didn’t think there were other ways I could mix things up because of how my walls were and the type of furniture I had. And I removed a rocking chair. Doing those two things affected my whole living room and I am loving it. So I agree 100% with you, when you try and mix things up or look at a space differently, you may be surprised at what possibilities open up. what a darling little table! what I really love though is your dresser moved over by the door…what a perfect fit. I always try to shop my house first and you’re absolutely right, it gives the home a cozy collected look like it’s grown organically over time. wonderful new layout! Love your finds! We are new to Seattle. I’ve been wanting to go to flea markets here. I was wondering if you could recommend some. Thanks a lot. I love the color of the walls. What is the name/brand of the paint? oops! All I needed to do it look a little closer. Thanks! I have looked again & again…may I know what paint color your walls are? Thanks!! 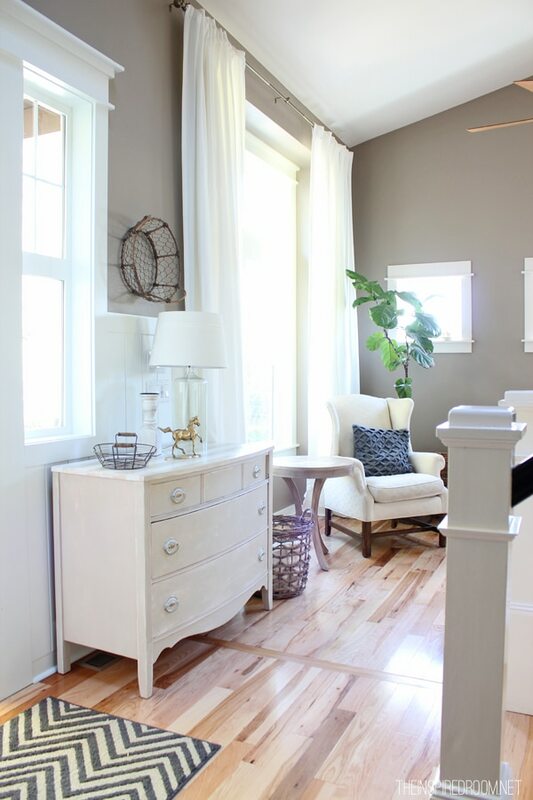 Yes, the darker gray is Studio Taupe, by Behr! :-) Thanks! I’m so glad you commented! And I’m really happy that the post and comments inspired you! Thanks for sharing, it made my day! PS If you don’t have my new book yet, you might enjoy it as well, it’s got a lot of my no or limited budget ideas in it to inspire and encourage! … Love the Home You Have (you can find it on Amazon.com). What is the width of your flooring? Where did you get it?